I have got feedback from Avast. Obviously it truely was a false positive. They say they fixed the issue in Virus Definitions update 181022-12 and that it might be necessary to restart your web browser to apply the fix. @Zylara probably you got the updated already. Just back from work and workout. Seem to be okay for me. I just checked via https://downforeveryoneorjustme.com/lair.silverdrak.de and got "It's not just you! lair.silverdrak.de looks down from here." PING lair.silverdrak.de (217.160.122.246) 56(84) bytes of data. It seems to be geographical then - it's fine for me. (UK) - the whole site itself isn't down. Which going by what happened with evina's earlier in the year suggests there isn't much Silverdrak can do about it. Interesting. If I use YOUR posted link to downforeveryone, I get that it's down. If I go there myself and test, it says it's just me. OK scrap that - now it doesn't do that any more. Actually, since 1&1 is a Strato-like webspace provider without much customer service (in my experience, at least), it may well be that said provider is currently having sporadic blips in its network. Yeah. I thought about 1&1 as the culprit, too. Let's just hope for the best that they get their stuff in order ASAP. Actually I just managed to reach the site just now. Let's see if this is permanent again. I've had no trouble at all at any time. It's fine for me. I've added several eggs this morning. 1&1 fused with a Cloud Computing company and they seem to be doing things in the background. Maybe the issues have to do with that. I assume it will be settled soon. If you keep having issues let me know. Is the Lair down this morning? It is unable to find my scroll nor can I add an egg by using its code. I can load the site, but it seems to be frozen, when trying to delete adults it tells me an error occurred, also it can't find my scroll. 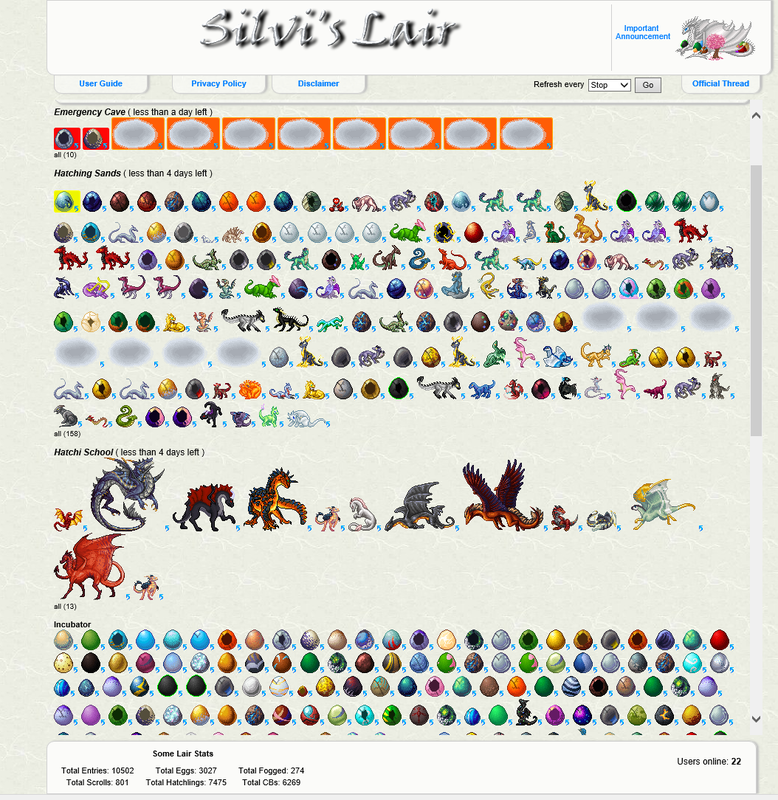 Funnily enough, it shows me different eggs and hatchlings in the incubator/hatchigarden everytime I re-load the site. That probably means that the site currently cannot access the DC API, for whatever reason. I'm getting the same thing - but the owner of another fan site said the other day that TJ is migrating everything to https and disabling http, so maybe that's making it dodgy. Still not working for me. I hope it will be back up. - or the connection to Dragon Cave failed (Try again or if DC is down, just wait until it is up again.). I changed to another site, hope Silvi will be back soon. 3. Those dragons are getting oversaturated with views. Can't add or update dragons still. Hopefully it gets fixed soon. This is one of my favourite hatching sites. Mine, too, and the number of fog patches has grown since that screenshot.